Hero symbol (top right) to see which Hero it belongs to. Stronger effect (the colored gem between the basic and the stronger effect - note the entire card is toned to that color, and whenever a card or effect relates to "Action card color", this is the color being referred to). The symbol in the upper left corner determines when this card can be played. 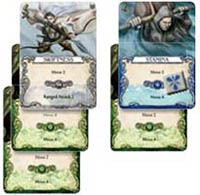 During any phase, you may play Special cards - they usually support other actions, or have their own unique effects. Also, Healing cards can be played at any time except during combat. To play a card, you reveal it from your hand and put it face up in your Play area. When doing so, you can decide whether you want to use its basic effect or its stronger effect. 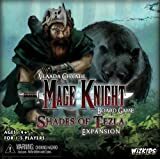 If you want to use the stronger effect, you have to pay one mana of the corresponding color on the card - you can use a mana die of that color from the Source (you can only use one die from the Source each turn), a crystal or a mana token of that color. You can also use a gold die or gold mana token during Day Rounds, since gold mana can be used as mana of any color. If you pay mana when you play a card, the stronger effect is applied instead (ignore the basic effect). If you don't, the basic effect applies. Most cards have simple effects like Move X (provides X Move points), Influence X (provides X Influence points), Attack or Block X (provides Attack or Block value of X). There are three cards with Move 2 as their basic effect. They have been played together for a total Move of 6. In the second example, one card has been powered by blue mana to provide Move 4, and played with another card with Move 2 as its basic effect. 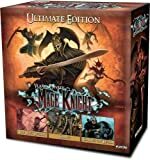 It can happen that you really need to do something (such as move, generate influence, create an attack or block, etc)., but you do not have enough of the right type of cards in hand to do so. Any card (except Wounds) can be played as Move 1, Influence 1, Attack 1, or Block 1. To do so, just play it sideways on the column. Cards played this way may be never powered by mana. In the 2nd example, gold mana is being used to power the Move card (which is the same as if blue mana were used). In the 4th example here is no move card, jus five cards played sideways as Move 1 - that's right, you can move even when you have no Move cards. Also note there is an Artifact and a Spell card in the stack - any card, no matter how powerful its effect, can be played sideways as Move 1, Influence 1, Attack 1, or Block 1 - except for Wound cards. 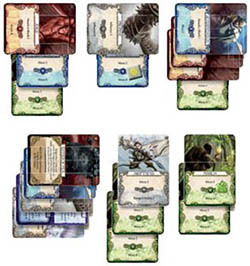 The last two examples add up to 6 Move points , since one of the cards is being powered by a green mana. This is okay since you can spend 5 of the Move points generated and let one go unused. 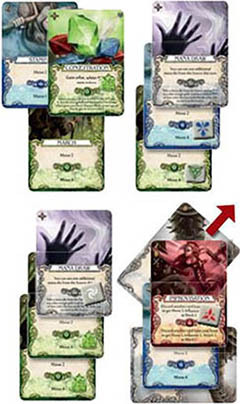 In the first example, the Concentration card is powered by green mana and used to play the effect of the Stamina card with a bonus, for Move 6. The March card gives another Move 2 for a total of 8 Move points. In the 2nd example, the Mana Draw card alows us to use an additional mana die from the Source, so we are able to strengthen both of the other cards. 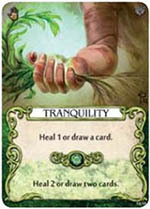 The 3rd example shows the strengthened part of Mana Draw. We take another die from the source and set it to green. We then gain 2 green mana to use on that turn which powers both of the other cards. In the last example, we use a red mana to power the strong effect of the Improvisation card to get Move 5. Along with a Stamina card and then any other card played sideways, we get 8 Move points. Note we had to discard another card to play Improvisation.